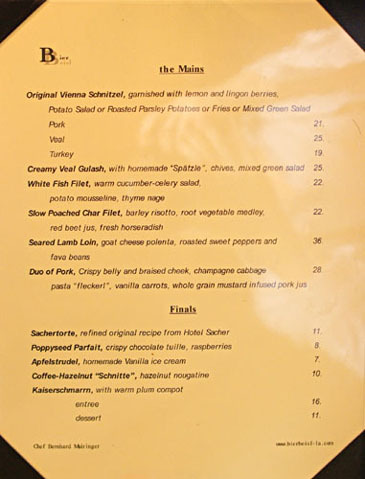 Somewhat ironically, despite the fact that Los Angeles' most famous chef--Wolfgang Puck--hails from Austria, the City has never really had a true Austrian restaurant, at least not in my culinary lifetime. That unfortunate situation changed on February 27th, when BierBeisl officially opened its doors for business. The name is a concatenation of Bier, which means beer (duh), along with Beisl, a sort of small Viennese pub, and the eatery is the work of a young Austrian chef: the 27-year-old Bernhard Mairinger. About the Chef: Chef Mairinger grew in up in a small town near Austria's Lake Attersee, not too far from the major city of Salzburg. Starting at the age of 15, he attended culinary school at the Höhere Bundeslehranstalt für Tourismus in the spa town of Bad Ischl, and during his studies there, served as a commis at the nearby Hotel Aichinger in Nußdorf am Attersee. Upon graduating from the HLT in 2004, he worked his way through a number of places throughout Europe, including Hotel Alex in Zermatt, Switzerland; Ashdown Park Hotel and Country Club in East Sussex, England; Hotel Zürserhof, a top ski resort in Zürs am Arlberg, Austria; and finally, the Michelin-starred Da Gianni in Mannheim, Germany. 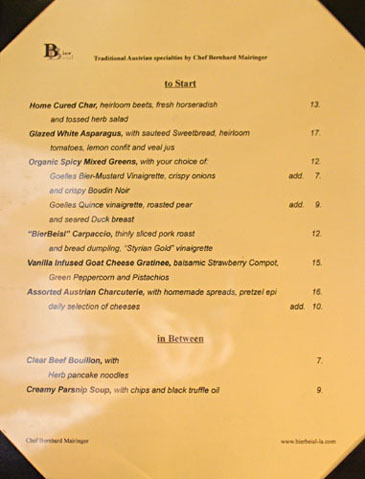 From there, Mairinger decided to move to the United States, first landing at Mammoth Mountain Ski Area's Parallax restaurant, where he served as CdC for Executive Chef Andreas Roller. In 2008, he was hired by the Patina Restaurant Group to work as Chef de Cuisine for Patina at the Hollywood Bowl, and from there, he transitioned to roles at Nick & Stef's Steakhouse as well as Patina, under Tony Esnault. It was at the PRG flagship where Mairinger would note the lack of Austrian cooking in LA, and decide to do something about it. BierBeisl occupies the building formerly held by La Bottega Marino, which has been revamped by Greg Bleier of Studio Unlimited. You'll notice new furnishings, paint, and fixtures, resulting in a warmer, homier ambiance, though the basic layout of the place remains the same: a smattering of tables in the middle, counter seating in front of the kitchen and schnaps bar, as well as a couple of tables outside. We opted for a seat facing BierBeisl's lilliputian kitchen, which seems like barely enough space for the towering Chef and his sole assistant. 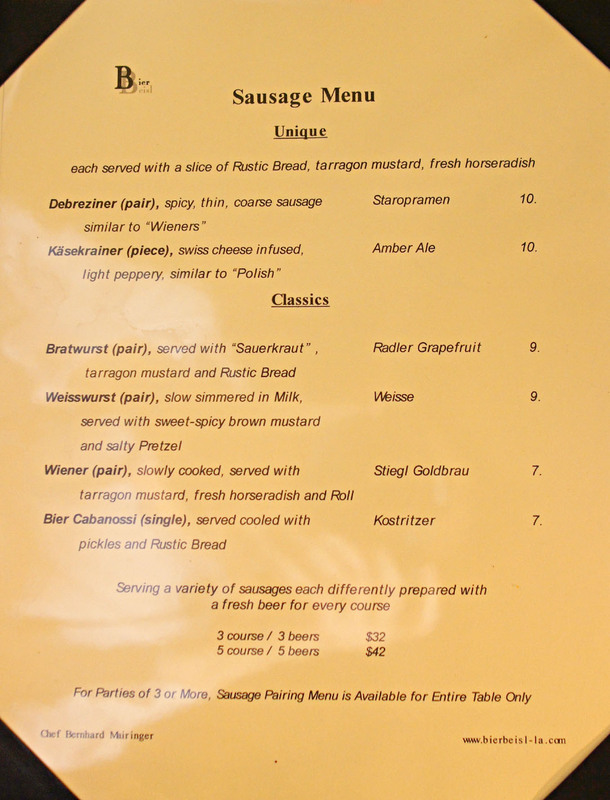 BierBeisl's menu features a seasonally-changing array of Austrian dishes, tarted up with a modern, Californian aesthetic. Of course, there's also a separate sausage menu with about a half-dozen varieties, custom-made for the restaurant by the highly-regarded Continental Gourmet Sausage in Glendale. Click for larger versions. To drink, we're talking about a small but unique selection of beers and spirits (notably the schnaps), joined by a separate list of Austria-focused wines (e.g. Grüner Veltliner, Zweigelt, Blaufränkisch). Click for larger versions. 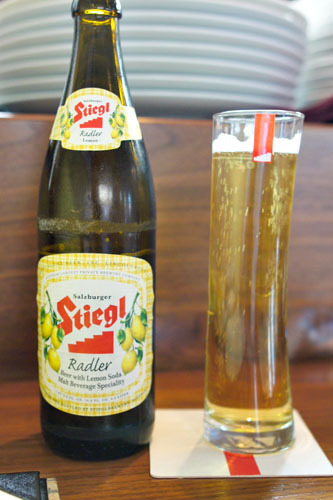 We began with a lemon-flavored Stiegl Gaudi Radler Shandy [$8], which is basically beer mixed with lemon soda. Not surprisingly, we found it crisp and refreshing, with bright notes of lemon over a lager base. 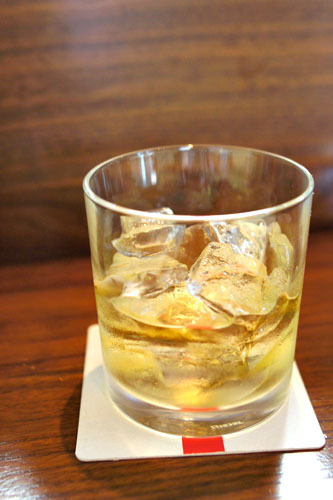 Sticking with the Austria theme, we also tried the Hans Reisetbauer whisky [$12], a seven-year-old single-malt from the famed eau de vie producer. The whiskey is aged in oak Chardonnay and Trockenbeerenauslese casks (versus the traditional Port or Sherry) from Austrian winemakers Alois Kracher and Heinz Velich, giving the spirit a rather unique character: malty and caramel-y initially, but with a marked spiciness and fruitiness on the finish. 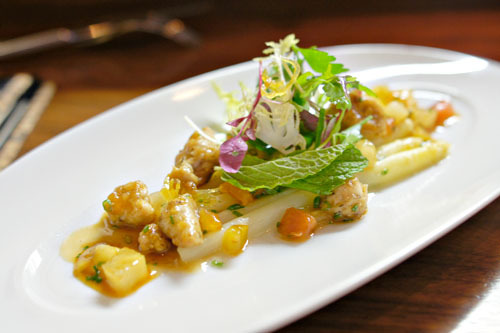 We were in the midst of white asparagus season, so we wisely took advantage of that timing for our first course. The spears here were exceptionally tender, with a mild flavor that was significantly less bitter than that of their green brethren. Of course, the sweetbreads were key as well, with their soft, savory, earthy taste adding weight and depth, while the tomatoes and lemon offered up tart 'n' tangy overtones to balance out the course. 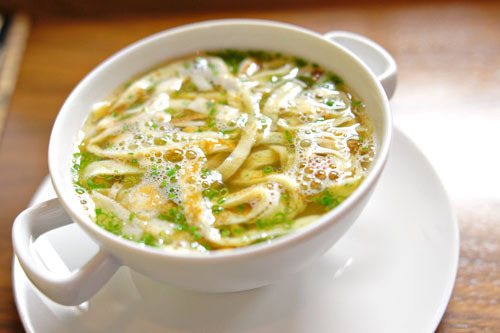 A well-made bouillon (the Chef's version of Flädlessuppe) was up next, with its intense, heady aromatics and boatloads of umami-rich flair on the palate, all countervailed by the well-placed bits of herb and the supple, satisfying noodles (the Frittaten). 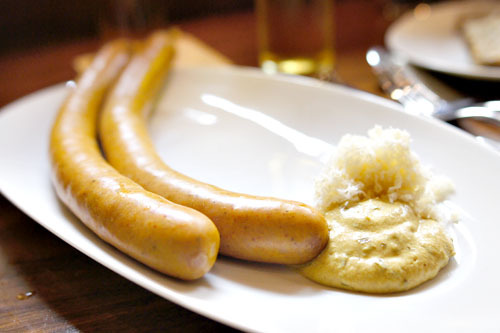 Käsekrainer [$10.00] | swiss cheese infused, light peppery, similar to "Polish"
Our first sausage can be thought of as a kielbasa stuffed with cubes of Swiss cheese. 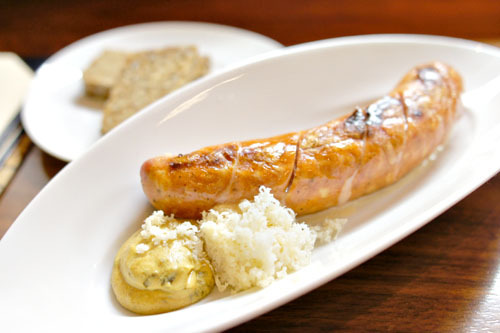 It was excellent, with the luscious, gooey Käse perfectly augmenting the rich, salty, satisfying smack of the sausage. I definitely enjoyed it alone, but really appreciated the tempering tang imparted by the combination of tarragon mustard and fresh horseradish. A must try. This was actually my first time having an authentic Wiener Schnitzel, which has nothing to do with hot dogs, but is instead a traditional Austrian specialty of pounded, breaded, and fried meat. Though the classic version is prepared with veal, we went with Schwein at the urging of our server. It was pretty much exactly what I had in mind: thin, tender cutlets of mildly-flavored pork, nicely crisp on the outside, though slightly monolithic. The sugary lingonberry and sour lemon, thus, were key in adding some variety to the dish, as was the accoutrement of warm, tart, vinegar-y potato salad. Having enjoyed the Radler above, we opted now for the Stiegl Goldbräu [$6], which actually forms the beer part of the shandy's equation. It was well-balanced and easy-drinking, though not particularly interesting, with a pleasant balance of hop and malt flavor, all with some citrus-y and grassy notes thrown in for good measure. 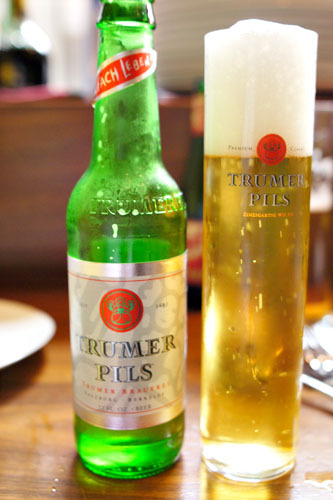 We also had the Trumer Pils [$6], an unpasteurized Austrian pilsner. This one was more fascinating, with a bright, slightly bracing hoppy character, as well as a bready, spicy, lemon-y twist that I couldn't quite put my finger on. 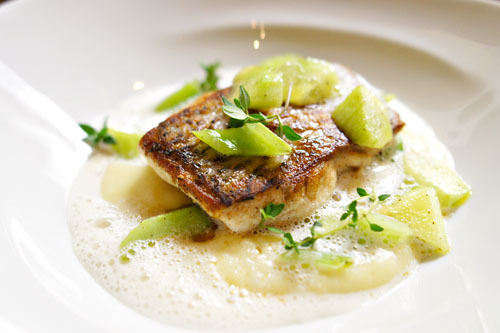 A filet of white fish was rather lovely--firm and flaky to the bite, with a clean, mild salinity that went swimmingly against the light, vegetal smack of the crunchy veggies. I also appreciated the gravity lent by the potato purée, though I would say that my only complaint was that I wanted the skin to be crispier. The veal-based Weisswurst was another first for me, and it did not disappoint. I found the sausage's very fine texture really appealing, along with its hearty, yet refined flavor, laced with just a tinge of spice. Delicious alone, but also great with a dab of the accompanying sweet 'n' sour Weisswurstsenf mustard. 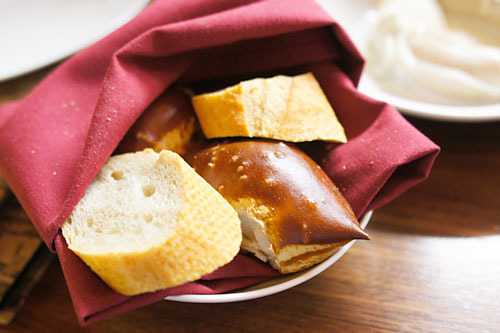 Accompanying the sausages was a basket of both baguette and pretzel breads. Debreziner [$10.00] | spicy, thin, coarse sausage, similar to "Wieners"
Our last savory item was a duo of debrecener links, probably the least unique of the sausages we had tonight, but still nonetheless quite delectable, showing off a straightforward savoriness and satisfying, semi-fine texture, all with just enough of a kick to make things interesting. Again, tasty either alone, or with the combination of horseradish and mustard. BierBeisl prides itself on its schnaps (one "p") selection, so we just had to give them a go. 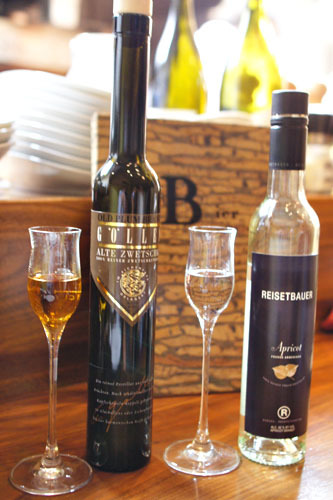 At the behest of our server, we chose the Hans Reisetbauer, Kirchberg-Thening, Upper Austria, Apricot [$8] and the Alois Gölles, Riegersburg, Styria, Old Plum [$7] to pair with the apricot and plum flavors in our desserts. These were nothing like what you're accustomed to with American schnapps, which tend toward cheap, boozy sugar bombs not usually fit for serious consumption. Instead, they were much more delicate, basically eau de vies in the style of a grappa, with subtle undercurrents of fruit, suitable for contemplative sipping. Definitely a style worth checking out. 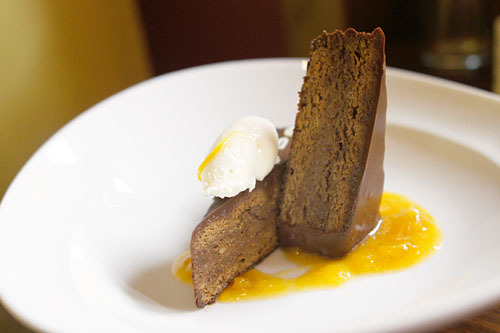 Desserts here are the charge of Pastry Chef Lisette Rodriguez, and our first was her interpretation of the famous Sachertorte, originally from Hotel Sacher in Vienna. It is, in essence, a chocolate cake, but a very good one, with a dense, yet light consistency and a sweet, but not too sweet relish. The key here was the apricot jam, which added a wonderful fruity component to offset the chocolate, while the topping of whipped creamed served to lighten the dessert. 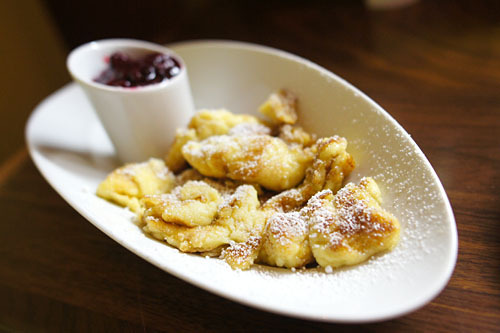 We ended with the highly touted Kaiserschmarrn, which I'd had actually once before at Spago. This was a more traditional version though, with the light, fluffy, eggy, slightly savory shreds of pancake playing beautifully off of the sticky, saccharine smack of the Zwetschkenröster plum compote. Unfortunately, I don't really have a basis for comparison when it comes to Austrian cuisine, but I can say that I enjoyed Mairinger's cooking here. The food was classic in essence, but with a decidedly modern slant that gave it a level of refinement, precision, and finesse that I really appreciated. I think it's great that we finally have a honest-to-goodness Austrian restaurant to enjoy, one that clearly demonstrates the Chef's passion and pride for the culinary traditions of his homeland. A wunderbar addition to the neighborhood, and the Los Angeles dining scene in general. 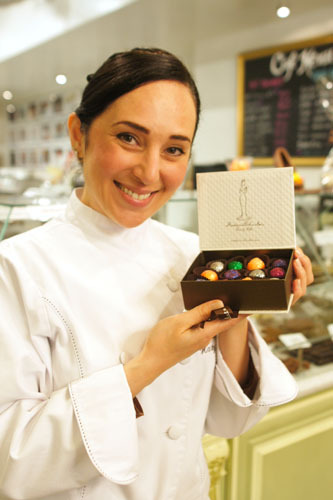 Before our meal at BierBeisl, we stopped by the nearby Madame Chocolat, a French-inspired couture chocolaterie helmed by Persian-American Pastry Chef Hasty Torres (née Khoei). 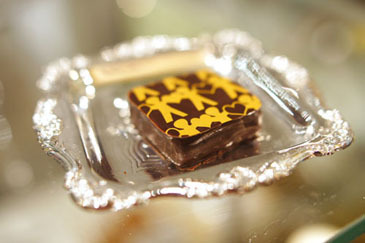 The gilded, green-and-yellow jewel box of a shop recalls the splendor of a Parisian parlor, but most of the 1,800-square-foot room is dedicated to the open kitchen in the back, which churns out hand-made chocolates daily. It's a family business here: Hasty's mother actually designed the space, while her father helps with running the business side of things. 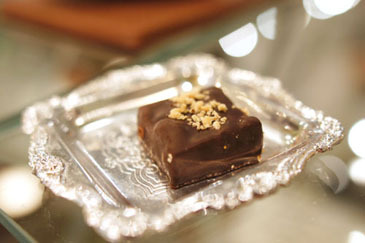 Even younger brother Johnny has been known to assist at times; his title is "President of Chocolate Affairs," while Hasty's is "Chocolate Executive Officer." Speaking of family, Hasty herself was born in 1975 in Iran, and the Khoeis moved to Los Angeles four years later, following the 1979 Revolution. They settled in Woodland Hills, and Hasty grew up in the Valley, eventually graduating from Louisville High, a private, all-girl, Roman Catholic prep school. Afterward, she attended USC and attained a degree in business, then worked for a financial firm in Century City for six years. However, she grew increasingly dissatisfied with her work, and decided to ditch high finance for haute cuisine, leaving behind the glitz and glamour of the Avenue of the Stars and enrolling at Le Cordon Bleu in Pasadena. Hasty finished after 18 months, and after a job offer at the Ritz Hotel in Paris fell through, she began working for Jacques Torres in New York in 2004, even becoming opening chef of his shop in SoHo. She worked for Torres for a few years, and the two even began dating during the period (eventually marrying in 2007). Despite the relationship, she moved back to LA to work on Madame Chocolat, finding and completely renovating a former office space on Canon Drive in 11 months. 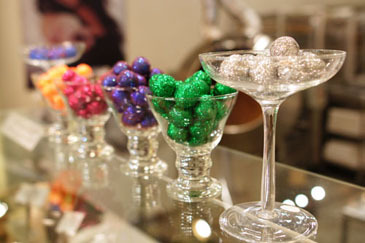 At age 31, she debuted her shop in December 2006 to considerable fanfare, and the place has been a fixture on the Beverly Hills scene since, with Hasty even appearing on The Real Housewives of Beverly Hills (where she made edible Christian Louboutins) and The Girls Next Door (in which she recreated Hugh Hefner's girlfriends' body parts in chocolate!). 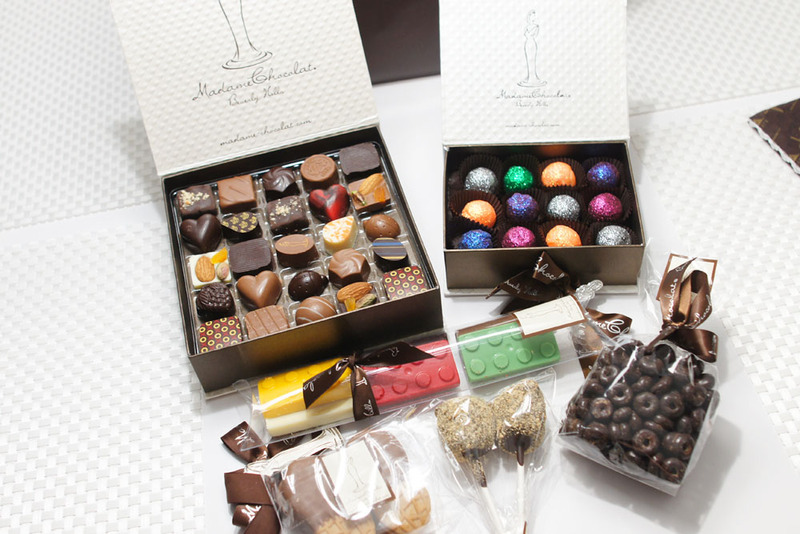 We had Dark Chocolate Coated Nutter Butters, Madame's Chocolate S'mores, Dark Chocolate Coated Cheerios, Chocolate Legos, a box of Hasty's famous "glitter" truffles, and a box of assorted bonbons featuring both hers and Torres' chocolates. 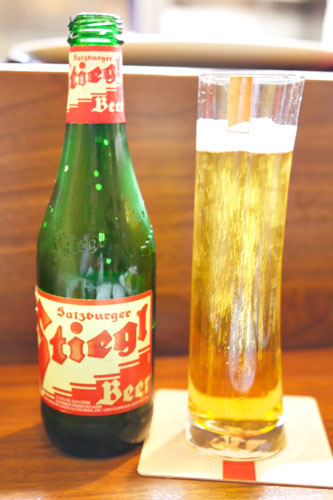 When I first read about Bier Beisl on Eater LA, I really hoped to read your review on it. Your comments on the Frittatensuppe is the most poetic description rendered by any diner, professional or not. It should be the new standard for describing our national lunch treasure. 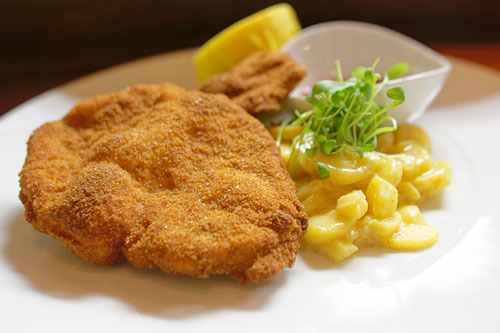 Judging by the images and reviews, Mairinger already does a better job repping Austria's cuisine than Schatzi on Main did. I might have to take my girlfriends there. I watched tv documentary on Jacques and they talk about his wife extensively! 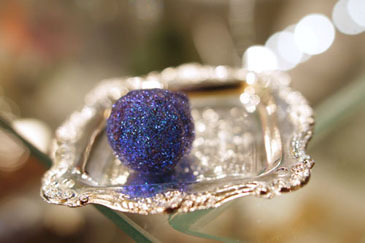 How cool to read about her shop on your blog. This is unrelated to restaurants in LA, but have you ever been to Minibar in DC? I was wondering what you thought of it since you've been to similar restaurants like Volt and Alinea. Having studied in Vienna for a while, this brings back memories of weisswurst breakfasts and schnitzel for lunch. 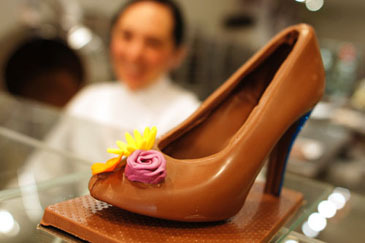 I was never fond of the sachertort, always a little too dense and dry. Peter: Great to hear comments from a native Austrian. Was not aware that the soup was called Frittatensuppe. Never knew about Schwarzenegger's place either! Nadege: Might not be a bad choice for such an outing. sygyzy: Nice timing! What were they saying about Hasty? Emma: I've not been to Minibar unfortunately, though it's definitely on my list. However, I have eaten at Saam at The Bazaar and é by José Andrés, which are very similar. Both come highly recommended. did you mean to leave a picture of the wine list off of the post? i'm interested in what they're carrying in Austrian wine. Jesse: Nope, I just forgot to get a photo of it. However, it is posted online here. I was surprised at how much I liked Bierbeisal. I went there not really expecting much. That Swiss cheese filled sausage was the best! I'd go back just for that! 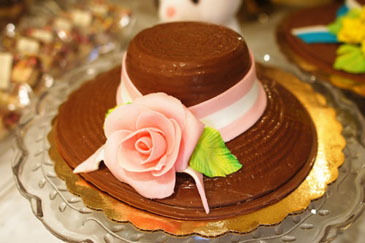 And you can't go wrong w/ Madame Chocolat. I finished everything I got and I want to eat more! lol! Did you eat all of that chocolate? ?